So I don’t believe in ‘antagonistic pleiotropy’ I think you’ve hit the nail on the head though in noting that it is neither the presence or absence of MYC (as most ‘wear and tearers’ think), but the amount of the gene that is the problem. It’s not that the body can’t down-regulate this gene – it’s that it doesn’t – or else there are factors that up-regulate it during aging. Are there any known humans born with an MYC+/- status? 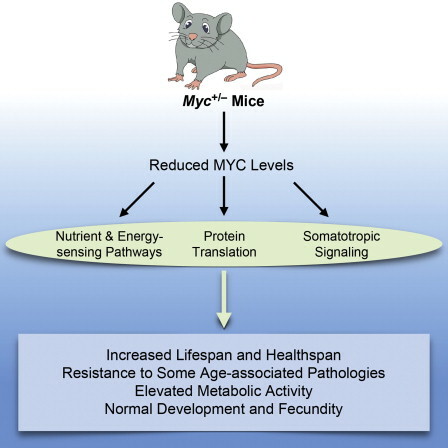 We would expect them to be rare, since MYC-/- means early death, but not absent. If there are such people, does the +/- condition express in other ways? Are they perhaps less handsome or virile, for example? It’s unlikely that a mutation would cause the MYC gene to be completely missing (+/-) but it’s quite possible that a mutation could cause the gene to be dysfunctional, and effectively missing. If this caused a disease, we would probably know about it by now. If it affects humans the way it affects mice, it’s unlikely that anyone with this rare genetic condition would ever be identified or their genome scanned for mutations. Also, papers on rapamycin as a cancer preventative and therapeutic agent, contrary to expectations.